Thank you for your interest in Stimulating Bar Electrode. Please complete and submit the form below and an ADInstruments representative will aim to get in touch within one working day. If you’d like to speak to someone immediately, office contact information is available from the contact page. The Stimulating Bar Electrode has flat disks, 30 mm spacing of 9 mm contacts. 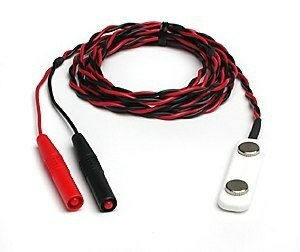 It is fitted with shrouded 4 mm connectors suitable for connection to any PowerLab with built-in isolated stimulators or the Isolated Stimulator. Suitable for nerve or muscle stimulation in Student Teaching laboratories, for example.